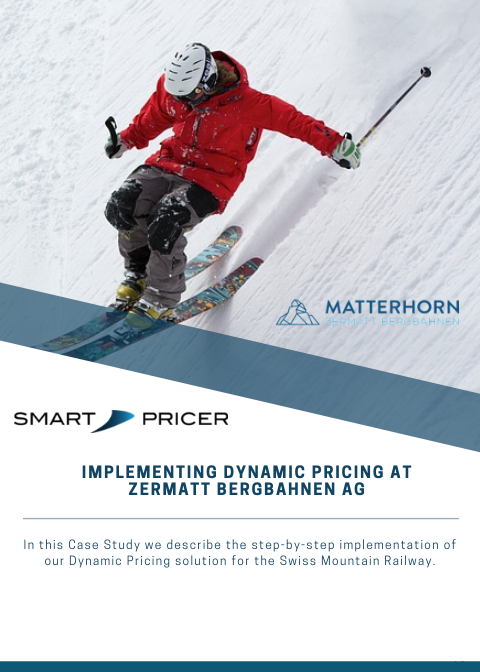 In this Case Study we describe the step-by-step implementation of our Dynamic Pricing solution for the Swiss mountain railway Zermatt Bergbahnen. Learn about the whole process of implementing Dynamic Pricing by downloading this Case Study. Our main goal for Zermatt Bergbahnen is to increase sales at off-peak times and increase online sales. We structured the project into three steps to get full insights in previous sales activity, define a new pricing strategy, and implement our automated pricing software. As the demand for ski resorts is highly adaptable to season and weather conditions, we focused on main demand drivers to set attractive prices for low-demand days and charge more at peak-times. Demand forecast and real-time adjustments based on booking behavior allow the best price-point setting for tickets for all point-of-sales. Consideration of weather, competitors, CRM, occupancy data, snow conditions, etc.